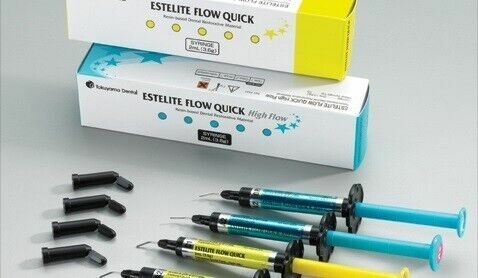 ESTELITE® FLOW QUICK - Medium Flow and ESTELITE FLOW QUICK HIGH FLOW are universal supra-nano filled resin composites offering a choice of two optimal flowabilities, superior esthetics, ideal handling, and excellent gloss and polishability, all in one system. Building on the proven success of the spherical filler and the patented Radical Amplified Photopolymerization initiator technology - RAP technology, Estelite® Flow Quick and Estelite Flow Quick HF provide an extended working time and quicker curing time. Estelite Flow Quick contains 71% by weight - 53% by volume, Estelite Flow Quick HF contains 68% by weight - 49% by volume of silica-zirconia and silica-titania filler.